Now through September 4, shopping at Sam's Club can help you maximize your school's earnings with bonus Box Tops for Education coupons on your favorite back-to-school items (including Cheerios, Ziploc containers, Ziploc sandwich bags, Honey Nut Cheerios, Pillsbury Chocolate Chip Cookies, Fiber One Oats and Chocolate Bars, Nature Valley Bars, Scott Paper Towels, Huggies Baby Wipes and Kleenex Facial Tissues). 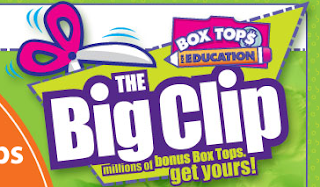 Box Tops for Education is also giving away one million Bonus Box Tops to America's schools: enter The Big Clip Sweepstakes for a chance to win the Grand Prize (500,000 Bonus Box Tops) or one of two first prizes (250,000 Bonus Box Tops)! 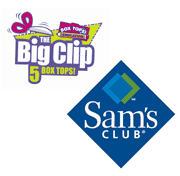 My BlogSpark has provided me with a free one-year membership pass to Sam's Club to take advantage of the savings and help spread the word about the Sam's Club and Box Tops for Education BIG CLIP campaign. My BlogSpark and Sam's Club would like to offer five of my readers one-day passes to see how many Box Tops coupons you can collect for the school of your choice. Additionally, one of those five winners will also receive a $25 Sam's Club gift card. To enter and win a day pass or $25 gift card to Sam's Club, please comment on this post with your favorite way to earn Box Tops for Education or what your school's Box Tops earning goal is this year. There will be five day pass winners and one of them will also receive a $25 gift card. Entries will be accepted through September 4th and I'll pick the winner using Random.org. US readers are eligible. Only one entry/comment per person, please. Our school goal is $500. I love supporting the school, we have been clipping all summer long. Gosh. Just about everything we buy has BoxTops (yeah, I buy a lot of packaged foods) but I guess consistently, it's the Toaster Strudels for us. I've been to Sam's Club one time and we lived in a tiny apt and no room to store all the big stuff. Now we have an Armageddon supply in the basement. With all the BoxTops ripped off. My children's classroom has a goal of a thousand box tops to collect this year. I love buying Fruit Roll Ups and Hamburger Helper they always have box tops on them. schools that my children don't attend. My favorite way to earn BoxTops is to harass my family and friends to save their BoxTops. They all know I like collecting them, so I always remind them to save them. I also try to purchase items that specifically have BoxTops on them. I have your button in the scrolling section of my blog, at the bottom: http://mommynotguilty.blogspot.com. I subscribe via email using luvdamall at aol dot com.